A few things you could add to the kitchen cabinet section. Wine Cabinet, and open shelving. can you get your measurements to show up on your project once you have finished your design? Can i send you my floorplan , you will see the back view of the inside. I just want opinions of it. Thanks! I need your google gmail. I downloaded the Floorplan Finder thinking that I could actually create a Floorplan like the website. 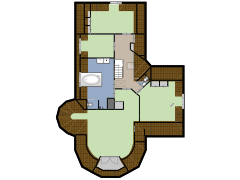 Can you make floorplans in Floorplan Finder ? If so, how? Can I message Floorplanner on Facebook? or send is there a way that you can view my floorplan here? I just want opinions on this but im just making this for fun. Anyway I can have just inches? Using feet is not practical since all appliances, furniture, windows, flooring, etc is speced in inches. i want to export a plan to KMZ but no button for that! any help please? Is het mogelijk dat bezoekers een versie opslaan van een gedeelde plattegrond? Zodat hun inrichting / aanpassingen bewaard blijven? COMO CAMBIO LA ESCALA DEL DIBUJO???? Please help! When I click on walls I want to split to make them curved, it won’t give me the option to split?? What am I doing wrong!!?? Hi, I am creating an open floor concept plan on the main floor but cannot seem to create new rooms….also where do I go to add stairs. Thanks for your help! I can’t seem to be able to pick the colors of the top walls in 3d view like you said on Facebook? How do I move windows so that they are just under the ceiling? I need a long narrow window. The old version of Floorplanner allowed me to paint walls, I have since opened Room Styler to enable painting. Room Styler does not replicate my plan nor is it a conducive tool to paint with…. is it ok to just make a floorplan for fun? como se guarda la imagen en 3d ? Some of my rooms show flooring however, there are rooms that I’m unable to change. All I see is the grid lines. I dont know how to edit the floor plan ?? ? Why did you block the doorway into the toilet with the stairway? I delete a file and another was deleted along. I need help!! !